"The cookbook was a bit of ahead of it's time in 2004, back then ingredients such as quinoa and agave syrup weren't so well known, 10 years later they are easily available in the supermarkets and people won't find them so strange"
Meanwhile thanks to everyone's hard work interest in veganism has grown enormously , one look at Google trends over the last 10 years will prove that." 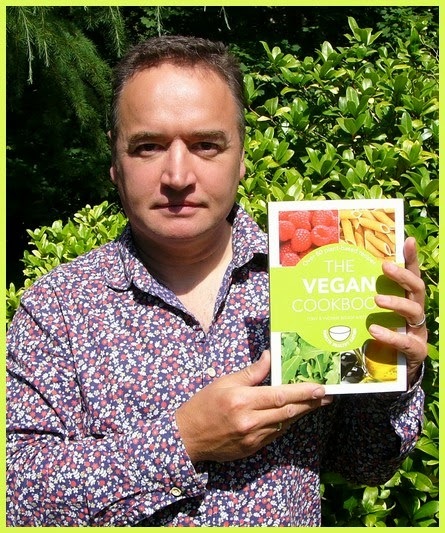 The Vegan Society 70th Anniversary, Tony's 20th anniversary as a vegan and 10 years of UK Vegfests seemed the perfect moment for Hamlyn to publish the Vegan Cookbook in it's new A5 format and a kindle version. Vegan versions of banoffee pie, omelette, the ultimate pizza recipe , chocolate ice cream and chocolate cake are ingenious, healthier and delicious. Photos are great and the nutrition reference section is handy for new and old vegans alike. So You want to be Vegan but Love Cheese?